Ursa Major Observatory is a remote-observatory located in southern france. It is a member of ROSA (remote observatories southern alps), founded 2008 by Daniel Marquardt and Karel Teuwen. 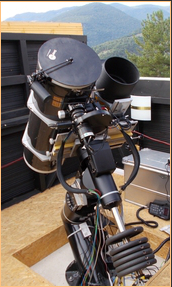 Ursa Major is hosting “Alkor”, an 10” Newtonian telescope and “Mizar”, an 5” Takahashi Epsilon for widefield imaging. In the past, I was imaging from different sites, but most of the time from Gahberg observatory in Upper Austria. From time to time I will release new images, so feel free to visit my site again Last update: 2019-04-18 (NGC 4274) CCD Guide 2019 is available now!